The MLB ratings for Game 5 of the World Series trounced “Sunday Night Football” by 36 percent, according to Deadline Monday. 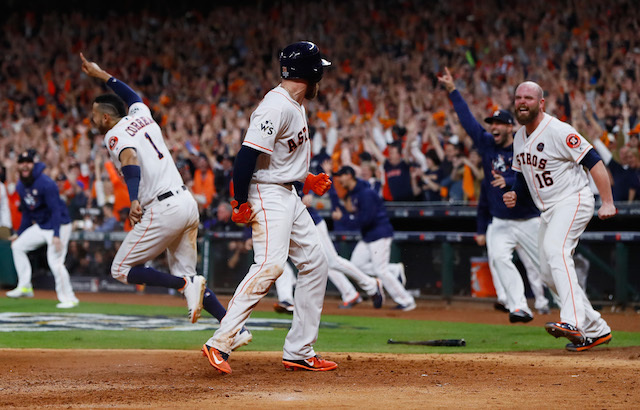 The second longest game in World Series history also ended up earning the second highest ratings a Game 5 has had since 2003. The night saw 20 million viewers tune in and a 5.5/17 among adults ages 18-49. In comparison, last year’s historic game 5 between the Chicago Cubs and the Cleveland Indians scored 23.6 million viewers and a 6.7/19 rating in the key demographic. The Sunday night football matchup between the Pittsburgh Steelers and the Detroit Lions failed to beat last week’s numbers by 25 percent and were down against the same week a year ago by 17 percent, bringing in 12.67 million viewers. Game 6 takes place in southern California Tuesday night.